So I wandered to one of my staples when in Hamburg, Alt Hamburger Aalspeicher — a temple for eel lovers. I’ve always had good meals at this Hamburg staple. Some call it a tourist trap, but it seems to attract a fully German clientele whenever I am there. In fact, except for the 2 dinners and at hotel reception I enjoyed being able to speak only German. This classic place I immediately felt comfortable, a family owned little corner along the Nikolaifleet, though when it got busier I felt bad for the properietor that ran back and forth up and down to the kitchen! It was slow, but relaxing. My beer showed up and soon also the first course, smoked eel on bread — traditional and solid. It was pretty much as usual, oily, rich and smoky. Excellent simplicity. My second course was the house-special eel soup. This was too sour for me, too much fruit used, so a little of a miss. Maybe I should have skipped this mid-course. 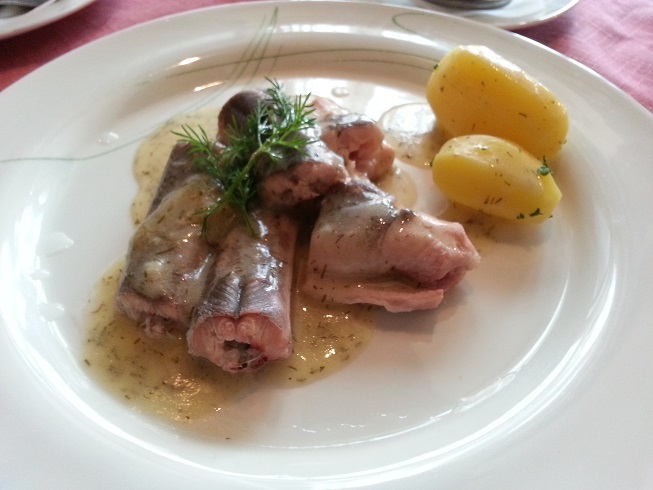 And finally, my main course was the eel in dill sauce. 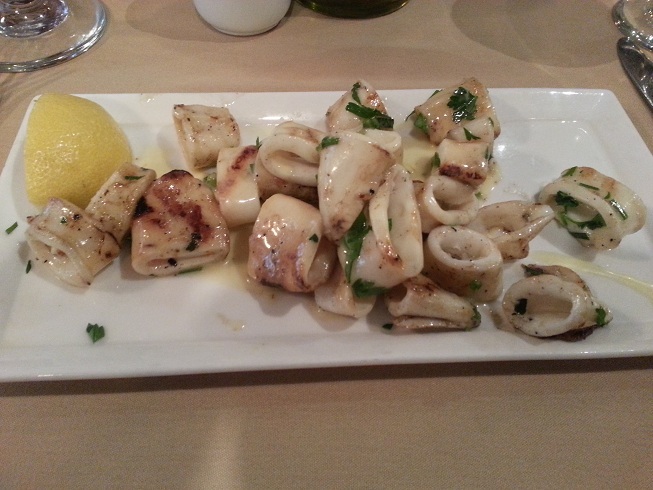 It was delicious, as the eel was oily and fresh, the richness in these thin treats of heaven. The dill sauce worked perfectly in small amounts with the already well-flavoured eel, but was excellent with the accompanying potatoes. Again, you know you’re back north when you see so much dill! 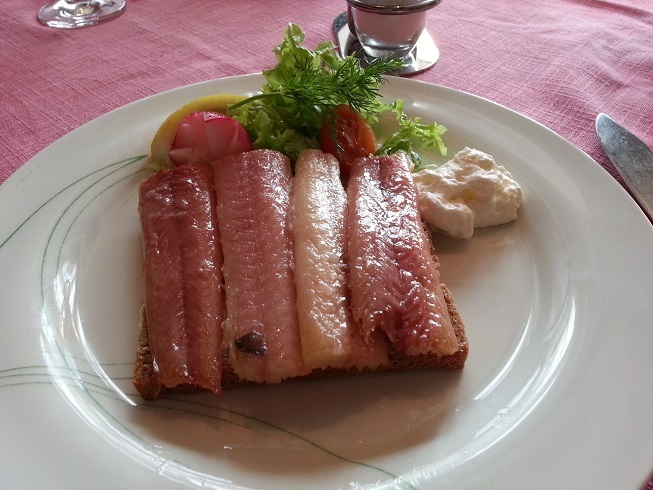 It was a nice lunch session on a rather busy Tuesday in this Hanseatic city, and I headed out into the cruel wind for a busy afternoon that I still felt rather pessimistic about…but the eel helped so much. I arrive back to the northern part of Europe — Hamburg, to be exact — just as the wintry stuff really hit central Europe. Crap, bad timing. I seem to miss the real cold and snow by a step each time this trip! Hamburg was just mild and windy, though it fell to a nice -5c or so in the evening. 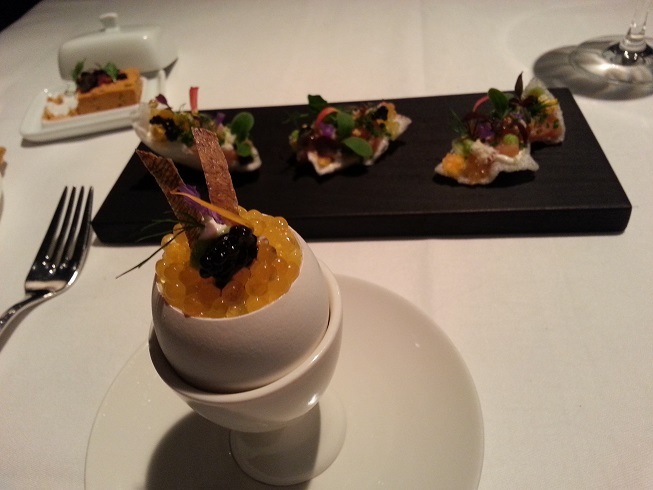 Arrival day was not to be busy, so I relaxed with a late booking at one of the city’s best regarded restaurants, the 1-Michelin Se7en Oceans. My stomach had healed well enough from the poisoning 2 days earlier to venture a full meal, so why not, right? I was seated in a rather quiet restaurant, perhaps as it was 2030 already on a Monday evening. A nice seat looking out to the Binnenalster’s large water spout, I relaxed for what should be a fantastic seafood feast. When the menu arrived, I was a little disappointed but also found a few interesting bits. The starters and middle courses looked a bit weak, as was the tasting menu, so I decided to improvise something with two main courses. I placed an order for the St Pierre (John Dory) and the salt-marsh lamb. Now that should be good! At this point some flavoured popcorn was presented as a snack. Nothing special, but good to much on until the bread selection arrived with a salmon herb butter. Some of the bread was so over-salted I couldn’t eat it…bad sign… And the amuse-bouche was next, a selection of fish-based treats. After a bit more wine — which I have to admit was good, and the pours generous — the main course of St Pierre (John Dory) arrived. I figured a local fish would do well here, and I love John Dory and have never had a bad one in my life. Now this confused me at first. 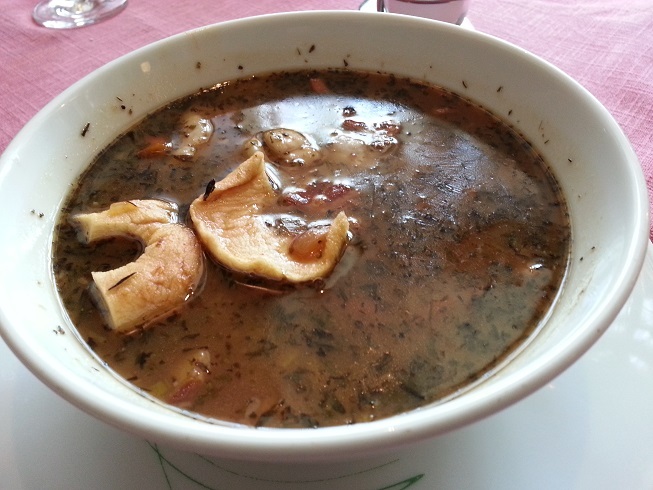 The dish was listed to be served on “black rice” but it turned out to be purple rice — not with ink as you would have expected by the terminology. And it turned out to be nearly all salt…I’ve *never* tasted something so ridiculously oversalted before. And it has a sour tinge to it. And the breading of the fish had a sickly, honey sweet taste to it. Now this combination is so conflicting and dreadful I can’t imagine who came up with it. They were each competing on which would make me give up eating first. It was the salt. I could strip the fish of the terrible breading, but not the rice of its salinity. I left it all on the plate and mentioned this to the server. To their credit they took it off the bill and offered me something else, which I declined. I really had just lost interest in the dinner after this disaster. After a nice after-dinner drink and coffee I had enough and headed out. 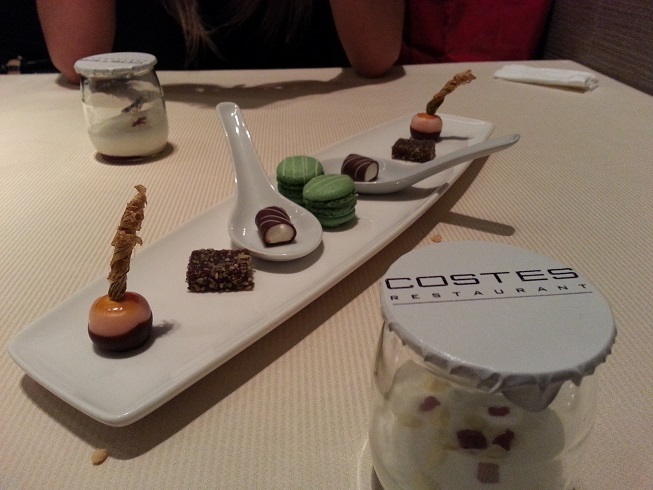 After my awesome meal at Costes with my gorgeous friend I thought nothing could top that…well, I was right. 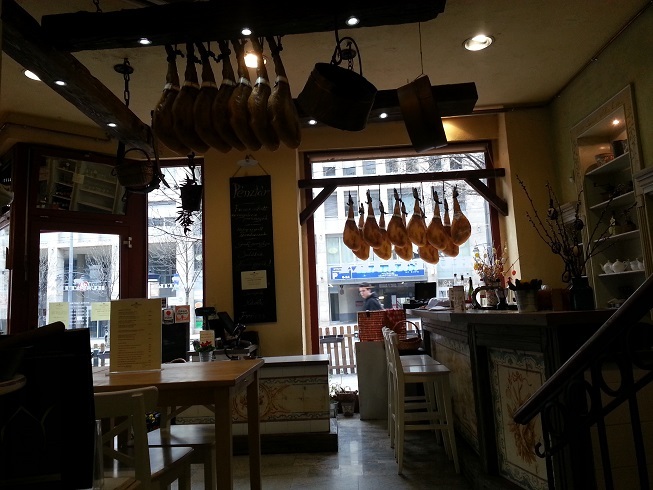 The next day I made my way over the Danube to check out what I would consider somewhere for a pilgrimage — a deli/cafe that specialises in mangalica! 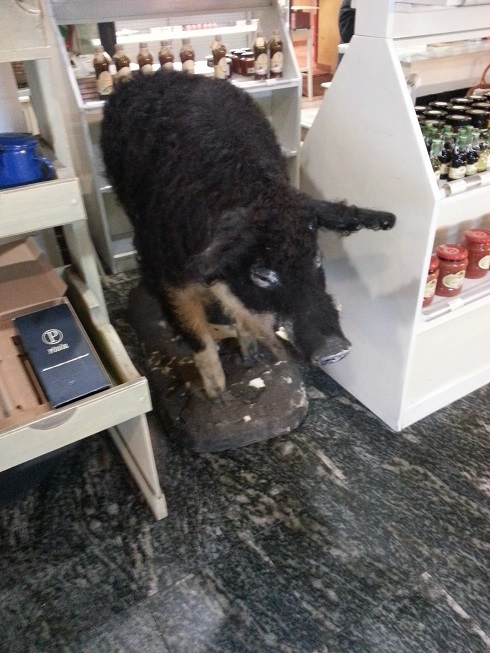 Now my readers know how I feel about this wooly beast, and I sought out this brilliant place: Mangalica & Társai Húspatika. And I almost wanted to take this home with me! The meat kept crumbling from overcooking and the condiments used were so contradictory to the flavours of the mangalica… It was trying to out-do the infamous McDonalds dodgy pickle… I was so unhappy with the food…and I left sad…very sad…a dream totally deflated… And I didn’t realise how much worse it would get. Now this is good. 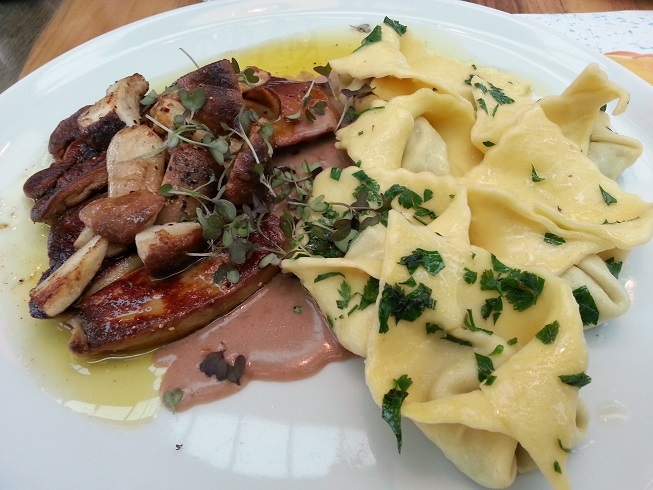 Grilled foie gras with porcini mushrooms and ravioli. Heavy, but beautiful, utterly Hungarian in its decadence. A perfect goodbye to Budapest for me as I fly on to Hamburg. This trip to Budapest showed the best and worst of it for me…my stomach will not forget it, for both reasons… Now let’s see what returning to the Hanseatic part of the world will do for my stomach. The minute I passed the Austrian-Hungarian border I started to relax and things just improved — especially my mobile data. The train has been a convenient way to get between the two, especially now Budapest is still somewhat air-challenged post-Malév. I was most looking forward to my dinner tonight at Costes, which is one of the very first restaurants in “new” Europe to get a Michelin star. Despite a little confusion at first with the wines and when we liked it served (they thought we were waiting for the courses), it ran pretty smoothly. 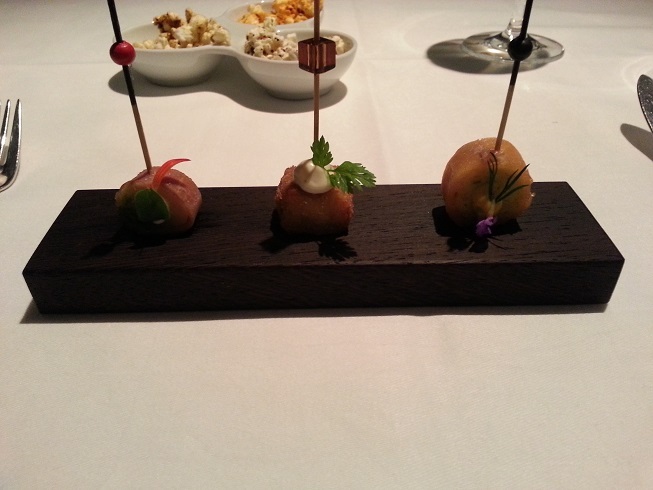 We were treated to the first amuse bouche that focused on the carrot. These treats were very nice, each with a different feel about it. Maybe not spectacular, and my friend thought the leek soup was a big miss, but it was a good start. Now I have to admit it was hard to concentrate on my dinner with a blonde goddess in front of you, but you gotta do what you gotta do! As it was already on the late side we both opted for the a la carte menu. 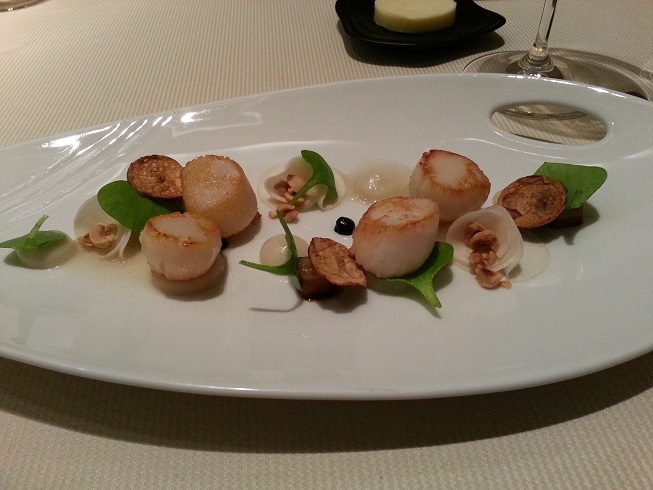 For my starter I enjoyed a rather tasty serving of scallops. After that delicious set of starters we relaxed over more wine and then our main courses arrived. Even though I had such a spectacular lamb the day before in Vienna’s Steirereck im Stadtpark, I chose the lamb once again. This did not disappoint either! 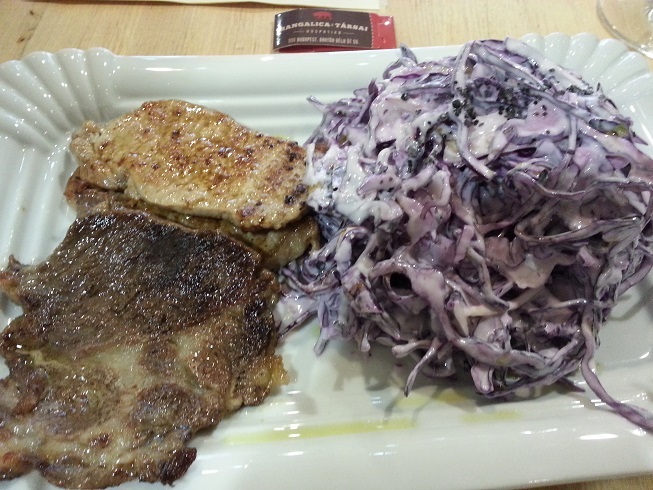 Cooked perfectly with just enough fat, alongside a fabulous selection of veg, this was a classic dish made perfectly. 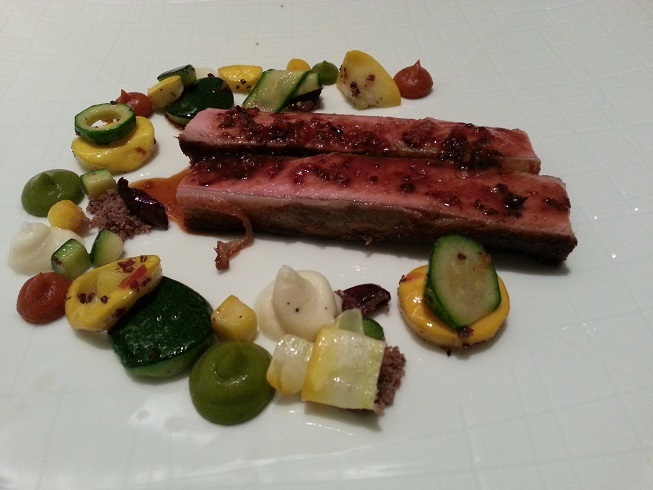 The lamb was very succulent…what’s with the lamb in this part of Europe? Blows the lamb away from elsewhere…wow…that’s two nights in a row. My friend enjoyed a very sizeable and meaty spiced monkfish tail. Now this is torture, but in the best way. 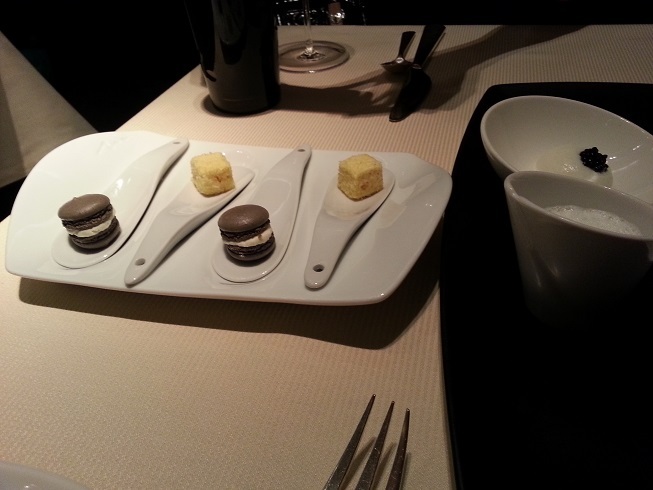 We took our time and slowly finished these tasty morsels too… What a fabulous meal. We ventured into the cold (yes, I was *not* wearing a coat again — to the shock of many tourists and locals alike) and I dropped her off at home before heading back to my hotel. 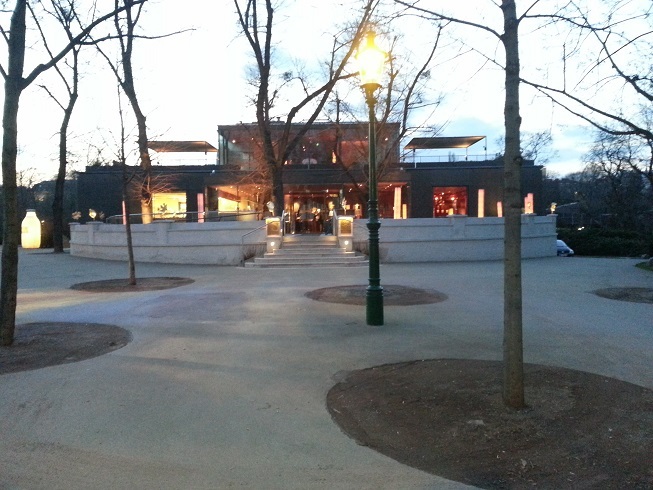 Last time I was in Vienna I couldn’t snag a table at the much-lauded Steirereck im Stadtpark — and had that god-awful experience at the god-awful Österreicher im MAK instead. This time I made sure such calamitous situation didn’t happen, and I managed to arrange a booking well in advance for this 2-Michelin institution. On the train from Schwechat I saw an article in the Österreich tabloid about how it came joint first as best restaurant in Vienna at 99 of 100 points in a local guide (with Silvio Nickol). Steirereck is in a cute building in the middle of the Stadtpark, and I wandered in just as it was opening for dinner service for my 1830 booking. I was given a very nice seat at the side that seemed like a throne — one from which I looked out at the rest of the restaurant in a panorama. It was early so service was extremely attentive. I relaxed with a local sparkling and smiled, hoping this evening will be a continuation of my surprisingly good day in Vienna. The menu soon presented itself and immediately I was both impressed and perplexed… Usually, even in top restaurants, I have dishes fly out at me from the menu. 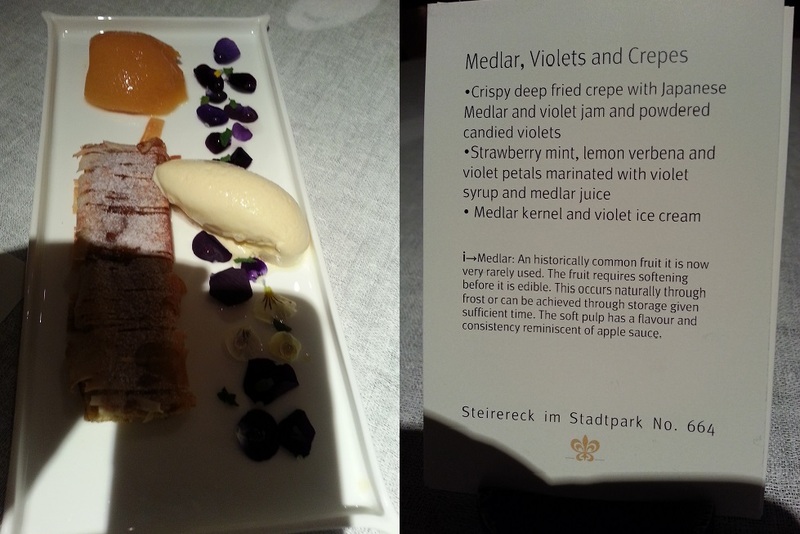 But from the list of ingredients listed I was now totally stuck…not just between the degustation and the a la carte, but also between the pair of choices on the degustation side… Now that’s impressive. 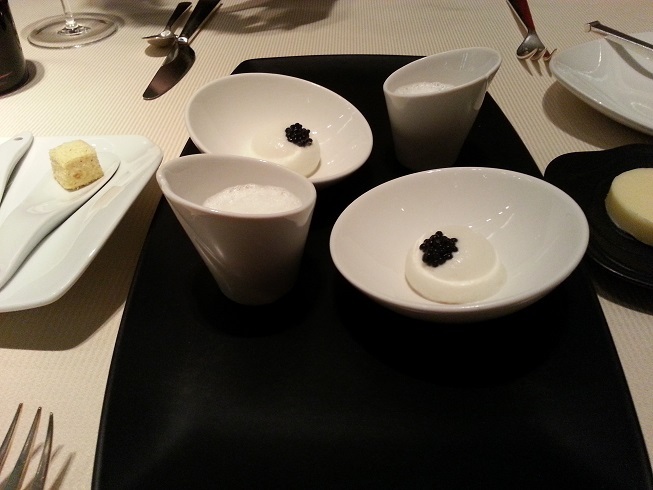 I then opted for the degustation and made my choices to the approval of the waiter. Some of the dishes are notable for me as they feature trumpet mushrooms, which I love, so I opted for them. 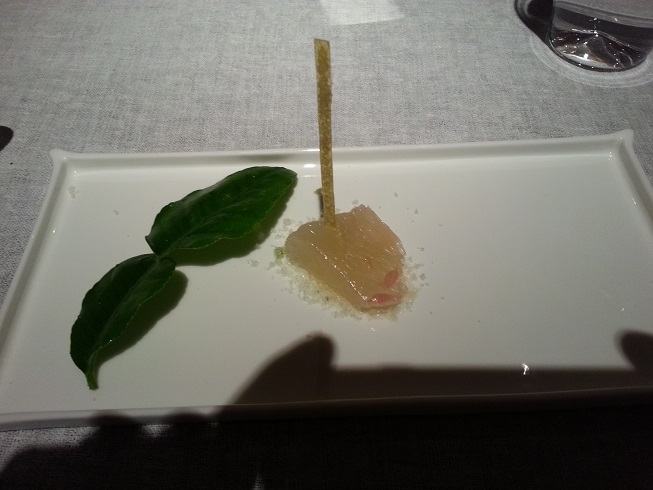 As I enjoyed the rest of my sparkling, the first of the amuse-bouche arrived. At this point the huge bread cart arrived…I have never seen such a selection of breads, a choice amongst more than a dozen different breads. 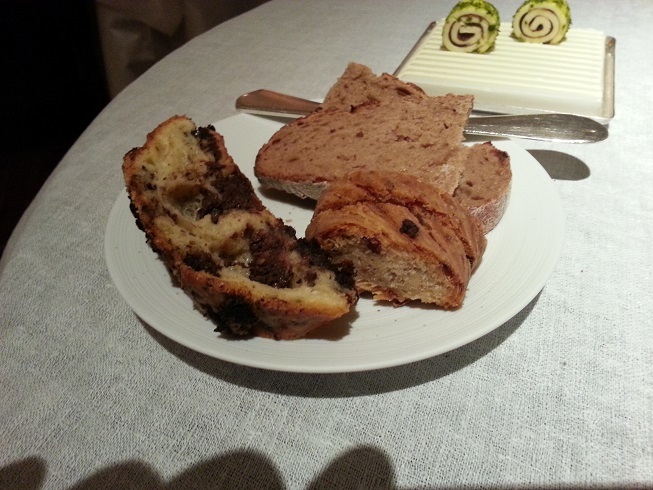 I immediately felt hooked to the bread with black pudding (!!!) — and was told it was a perennial favourite. I also had some with crackling (!!! ), and finally some “beer” bread. I’m sorry I should have taken photo of the bread cart, but I was drooling and shaking! My server nodded with approval, saying my choice was the “breakfast for real men” — lol! It says a LOT that I skipped the bread with bacon! I was so in love with this place by now…and I’m *not* a bread person! 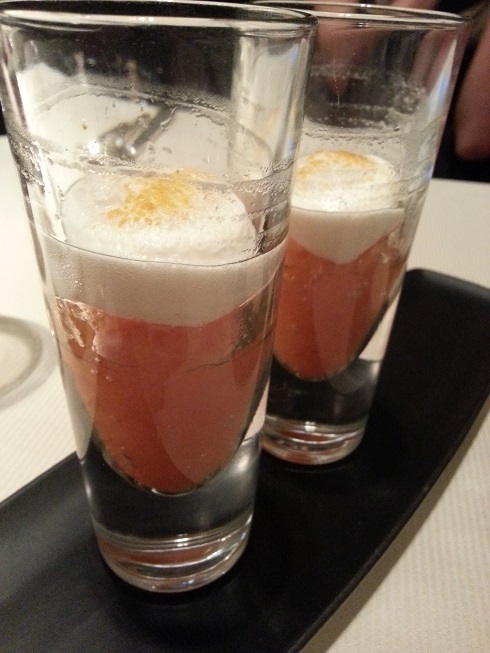 The last of the amuse-bouche arrived, an oyster-centric treat. A nice final palate-pleaser before the main production began. Good timing, as my sparkling was just about drained. The restaurant was getting busier now, and some larger parties were coming in. 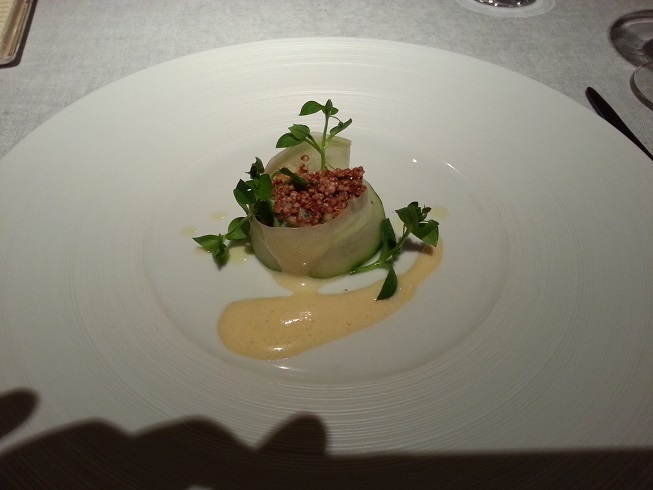 By then I was receiving my first course, based on salsify. They were nice enough to present cards with full description of the components, so you can see for yourself. With a paired local white it was terrific. 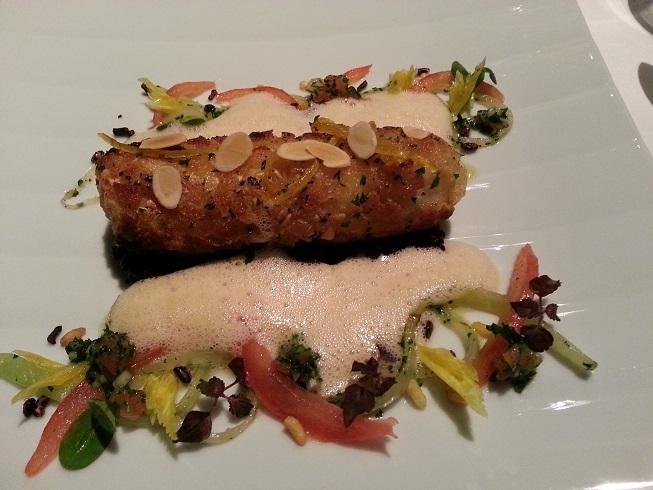 The salsify was excellent, as was the goat cheese. 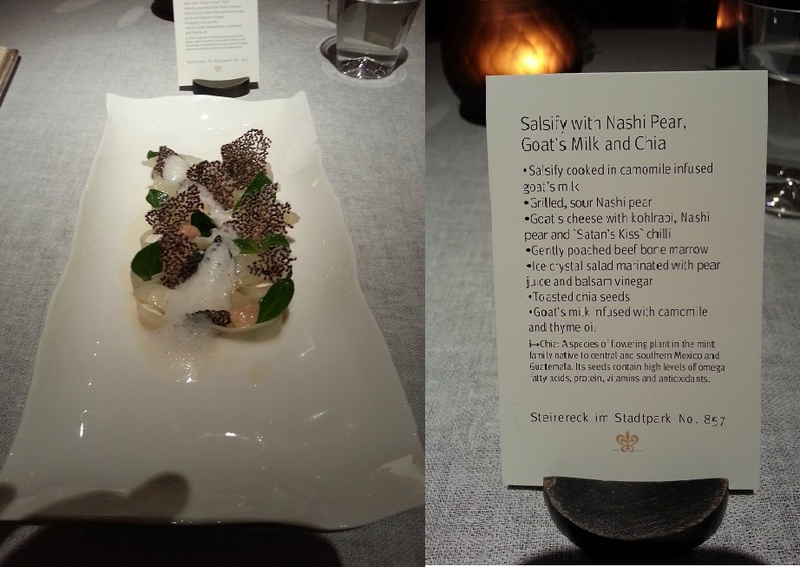 I particularly enjoyed the toasted chia seeds, but the marrow was somewhat flavourless. But all together in one bite it was a great combination. I was very happy so far. The fried sorrel were soggy and tasted like they’ve been sitting around, the mushrooms were nearly non-existent. There were 2 razor-thin translucent slices of king trumpet and the diced sauteed ones just didn’t work — did not needed to be diced as it loses its natural charm. I was particularly unhappy with some poor planning and poor execution on this dish, and was the only dish I did not finish (not by a longshot). What a shame…and I hinted this to service staff. Dish number three was one the waiter was particularly excited about, but it wasn’t as good as I had hoped. It was based on the local “mountain” trout, which is considered an exotic breed with good marbling. I was not expecting too much when the next dish came, the duck. However I was pleasantly surprised with this one. I have to say this was one of the best lamb dishes I’ve had in many years. The lamb was extremely flavourful even at medium (as chef recommended), with enough fat to bring out the best of this dish. It seriously revived my hopes for this kitchen. By now the short pours have really bothered me and I asked for a second glass of wine (and they didn’t charge me extra, to their credit). And the restaurant was now packed, and service has become noticeably stretched. Not good in a 2-Michelin place, sadly. Not the staff’s fault, more managerial fail here. As I chose to skip the 6th dish and cheese, my dessert based on the calamansi came out. 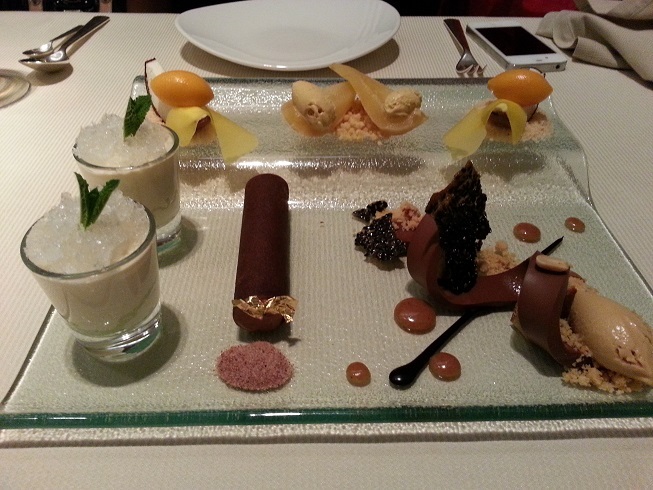 As nice as that is, bringing two desserts out — both with quickly-melting ice cream — was perhaps not the best idea. It was hard to enjoy both before it was all melted. 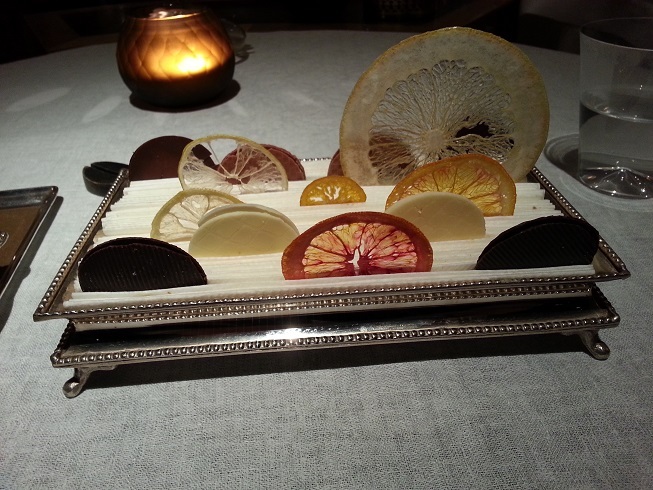 The calamansi was nice, over a bed of walnut and chocolate gratings. The crepes on the other plate was nice too. I was having mixed thoughts about this restaurants, noting the inconsistencies (especially in execution and service) — which really shouldn’t happen at a 2-Michelin place. As I enjoyed a nice red pear spirit and espresso, it made me wonder why this place got 2 and some places more deserving got only 1 and some extremely deserving ones (such as Ylajali in Oslo and Die Quadriga in Berlin) did not get anything. 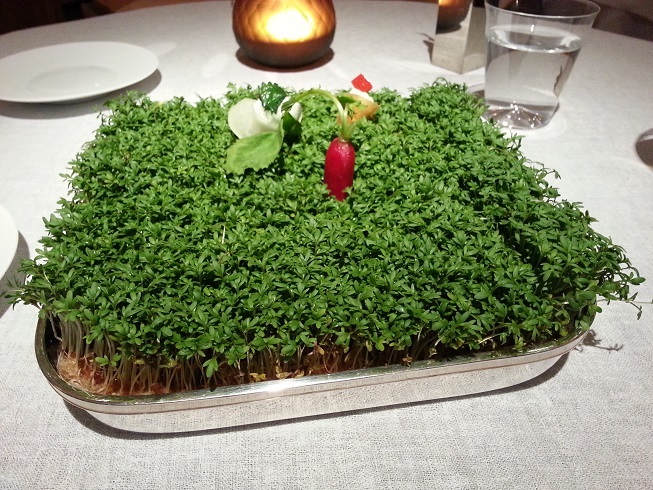 If this is a 2, Maaemo in Oslo should be a 4-star place. Shows a major bias in the Michelin system. They brought out some candied citrus for a closer off yet another impressive cart. I have to say the production of this place was fantastic and is very show-off’ish, from the big bread cart-from-heaven to the tea/herb cart to the citrus cart. And even the loos…the craziest gents I’ve seen in ages (for decorum purposes…this is a food review after all…I won’t post the picture of the neon-green urinal pod here). But what I take away, aside from the amazing bread with black pudding and the lamb, is this restaurant’s inconsistency. It was good, and I had a nice time, but it needs some quality control to even things up to keep its high standards running throughout the dining experience. After that bad Schnitzel at Plachutta last time, I decided to go to the better-known Figlmüller for my Schitzel fix this time. Smiling, friendly and attentive waiters, what? In Vienna? Wow. And the Schnitzel? 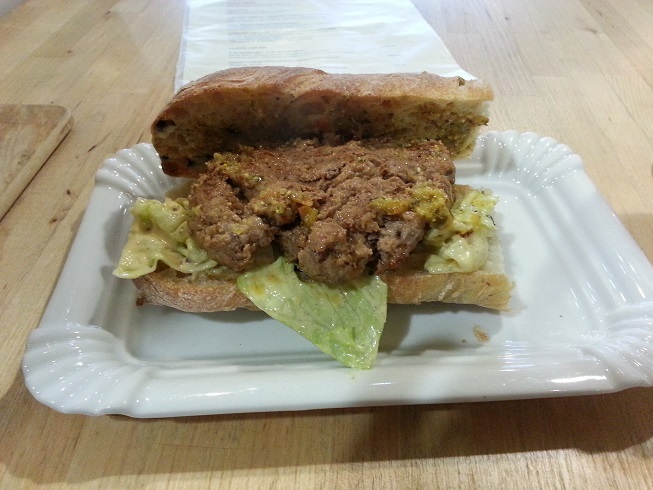 Excellent and flavourful, and the breading was not intrusive and the meat was juicy. 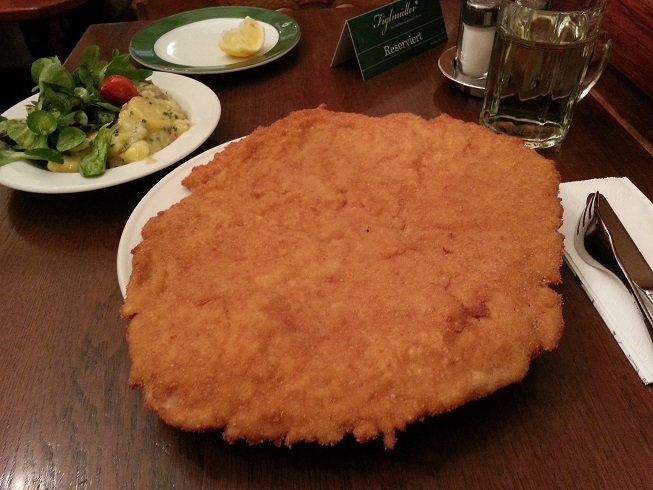 This is how a Schnitzel should be! Only issue is that the wine was rather acidic…very acidic… But was dirt cheap. The potatoes and greens were a nice side, much needed too. Excellent, puts Plachutta to shame! Tourist trap sure, but when a tourist trap does what it does well, it’s worth it. Feeling optimistic in Vienna…now that’s a mouthful! I usually don’t like to write a review when I dine with a friend, but I will make an exception today. We’ve been so focused on Cyprus in recent days, I figured some Greek food would make a nice balance — to enjoy the good stuff from the Mediterranean after the barrage of bad news. I recalled to my friend, who I have known for over 20 years since the 1st week of college, a time we ate together at the Souvlaki House in Ithaca — when I lived upstairs from it. How times have changed… But amazingly, half of what we talked about was the same topics as it was back in the early 1990s. This is truly one of the joys of moving back to NYC for me, to spend more time with my closest friends. Ammos, located conveniently a block from Grand Central, was a perfect place for us to meet for lunch. As usual, the place was bustling for the busy lunch service. We both chose to go with the prix fixe lunch, as the selection was quite good. I’ve been going to Ammos now for years — even when I was exiled in Connecticut, as it was a convenient place to wait for my train over a glass of assyrtiko. It has never disappointed, even when I’m in a rush. The only thing I wished they had was halloumi — not just because it’s a Cyprus dish, but it’s just utterly addictive to eat. Today I began with one of the staple dishes I’ve had here for years, the kalamari. Grilled nicely, these rings are accentuated by the lemony aioli. A very nice start, as well as my glass of assyrtiko. 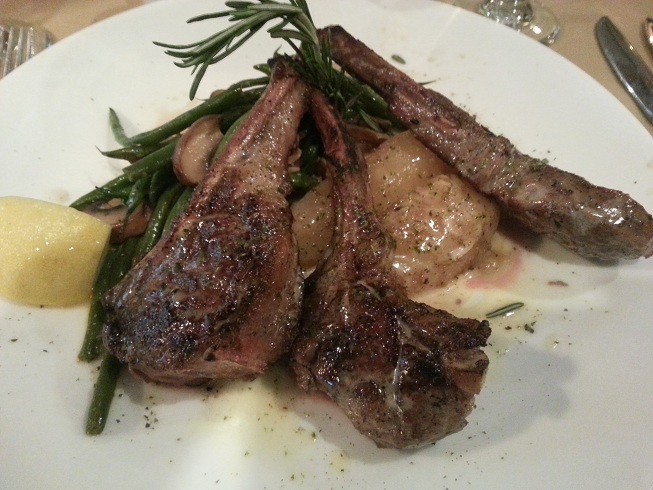 We continued to chat as my main course arrived, the rack of lamb. Grilled to a perfect medium rare, these were excellent — much better than the same dish I had at Rafina a few weeks ago, much better. Juicy and cooked just right, it was a nice treat before I head off on a very food-heavy trip to Europe. I’m not a dessert person but the prix fixe menu price just made sense — it would have cost more if I ordered the previous 2 dishes a la carte. So the dessert of karidopita — a walnut cake — was a nice end. Maybe a little too sweet, but a nice end.